The first step in the manufacture of raw sugar from cane juice was to crush the cane by pressing it between the rollers of a sugar mill. 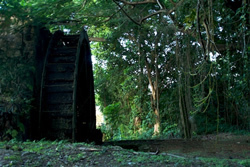 During the sugar plantation era, where flowing river water was available and could be harnessed to power a sugar mill, a waterwheel was frequently installed to provide the power to turn the mill’s rollers. At Drax Hall, the water came from a dam on the St. Ann Great River, which formed the western boundary of Drax Hall. 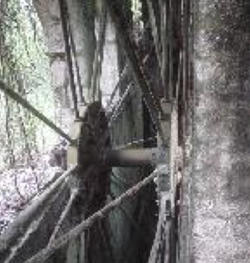 It travelled in a gutter, through Dam Piece, to the main road, then along the road until it passed underneath to a dam near the estate’s entrance gates, and finally was carried in pipes to the works. The considerable cost of the construction was recovered in the plantation’s greatly improved productivity (Higman 1988:101). According to Higman, the significant increase in productivity at Drax Hall between 1750 and emancipation was in large measure a result of improved milling efficiency (Ibid). The estate had discontinued the use of the distant windmill and set up a watermill. Drax Hall was first established as a sugar producing entity; it remained a sugar estate through the 1880s before switching over to bananas and cattle and finally copra after 1905 (Armstrong 1990:30). Like many estates in coastal St. Ann, Drax Hall produced pimento as a secondary crop. 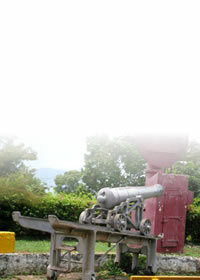 Drax Hall Estate was founded in 1669 by William Drax who came to Jamaica from Barbados (Higman 1988:99). Upon William Drax’s death in 1691, the estate was passed on to his son, Charles Drax who owned the estate until he died in 1721. The estate was then passed on to Samuel Reynolds, Charles Drax’s brother- in-law. William Beckford acquired Drax Hall Estate in 1722. According to Armstrong “William Beckford’s acquisition of the estate initiated a period of nearly sixty years of absentee ownership, first by Beckford, until his death in 1770, and then by his son William Beckford, owner from 1771 to 1821” (1990:27). 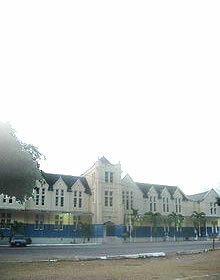 The senior Beckford was said to be the richest planter in Jamaica. 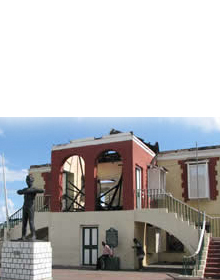 At his death he owned nine sugar plantations and was part owner of seven more as well as nine cattle pens and a house in Spanish Town (Higman 1988:99). His son was born in Jamaica, but became an absentee. In 1821, Drax Hall passed from the Beckford family to John H. Pink, who died in 1841. The Sewell family later purchased Drax Hall Estate and today the property is in the hands of Drax Hall Limited, a subsidiary of the Gulf and Western Corporation.